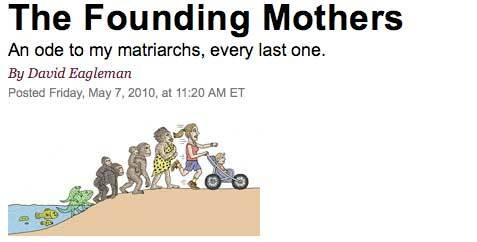 Our newest board member and recent Seminar speaker David Eagleman has published his very Long Now Mothers Day essay over at Slate. Happy Mothers Day to the long line of Mothers who brought us all here! In honor of Mother’s Day, I’m going to spend five seconds thinking about each woman in the proud line of matriarchs who brought me here.My mother left a biology career to become a politician and a painter. She gave up cigarettes in her 30s, shoulders unreconciled issues with her father, and is unable to operate any video player newer than a VCR. The soup cans in her pantry are always in neat alignment. She is tall and striking, and was once cast in a commercial to play Cleopatra. At the five-second mark I turn to thinking about my maternal grandmother. She became a locally famous grower of roses when her husband invested in oil fields and lost the bet. She died in her late 60s, drifting in a deep dementia and believing that she was standing in the snow-covered barn of her childhood. At 10 seconds I consider my great-grandmother. Her beauty stopped traffic when she was younger, and she struggled for two-thirds of her life with the slow fading of that power. She wore makeup and expensive clothing and clung through two husbands to the habits of pretty women. She was terrific at playing the harmonica.